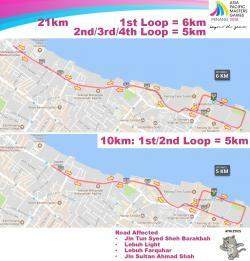 Asia Pacific Masters Games 10km/21km Road Race! 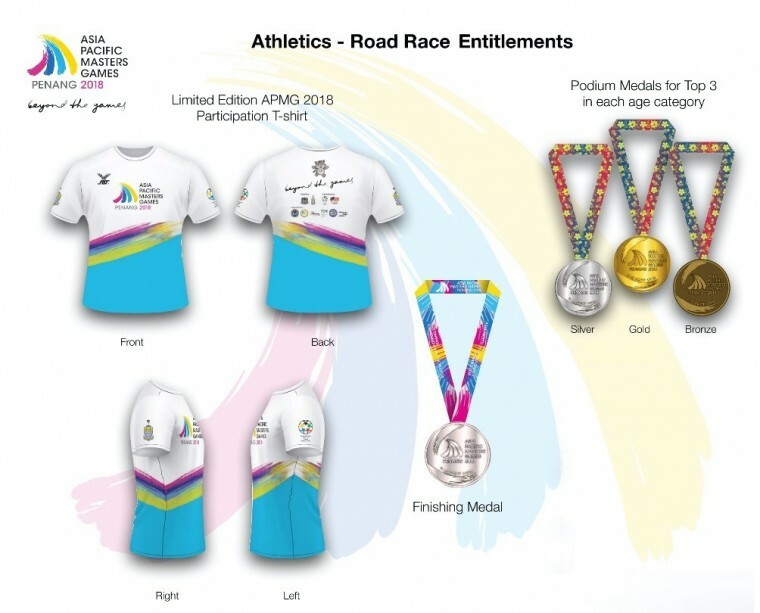 What is Asia Pacific Masters Games (APMG)? Before you understand what is APMG, we need to know what is World Masters Games. The World Masters Games is an international multi-sport event held every four years which, in terms of competitor numbers, has developed into the largest of its kind. Governed by the International Masters Games Association (IMGA), the World Masters Games is open to sports people of all abilities, anyone can participate in the games so long as they are over the age of 30 though some sports will allow athletes who are younger than that. Participants compete for themselves – there are no country delegations. Beyond the age requirement and membership in that sport’s governing body, there are no competition qualification requirements. The 1st Asia Pacific Masters Games (APMG) Penang 2018, Penang has the honor to be the host for the inaugural Asia Pacific Masters Games from 7th to 15th of September 2018. 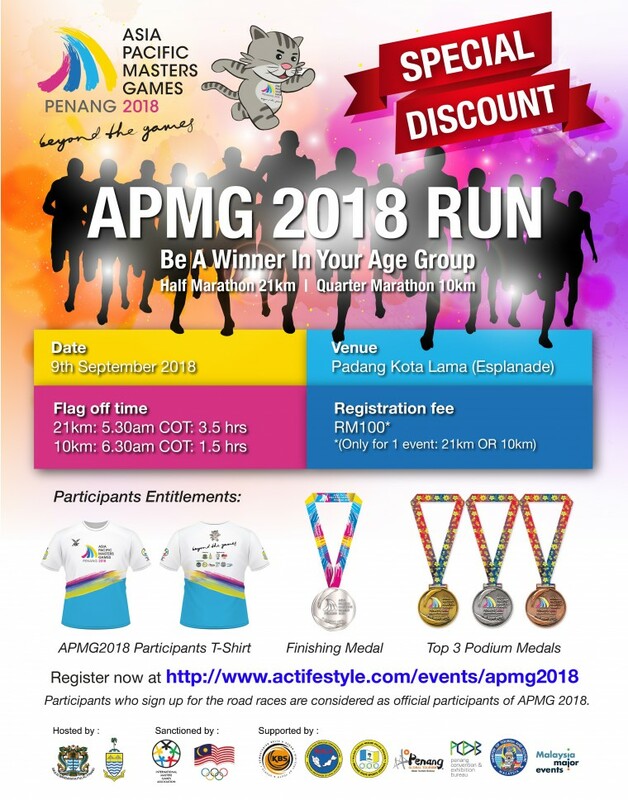 Now, we are offered with a Special Deal for all Actife Style Concept members, Penang Run and Penang Ultra participants on the Asia Pacific Masters Games 10km and 21km Road Race with RM100.00 registration fees for Malaysian. Don’t miss this golden opportunity to race with the Masters on 9th September, 2018. What you entitle with RM100.00 registration fee? 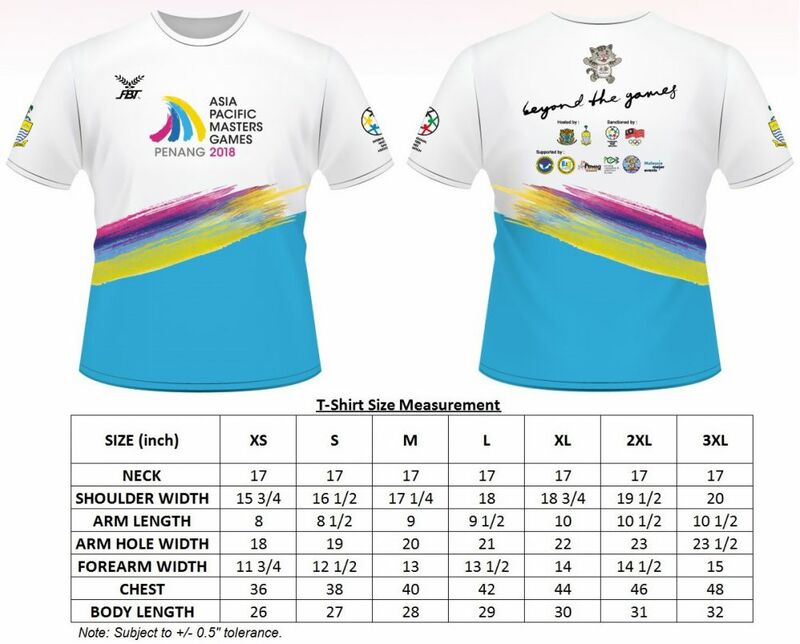 A Limited Edition of Asia Pacific Masters Games T-Shirts. A Finisher medal for those completed within the cut-off time. Podium Medals for Top 3 in each age group. The invaluable experience to participate in a Masters Games especially the first of its kind, furthermore in our home ground. 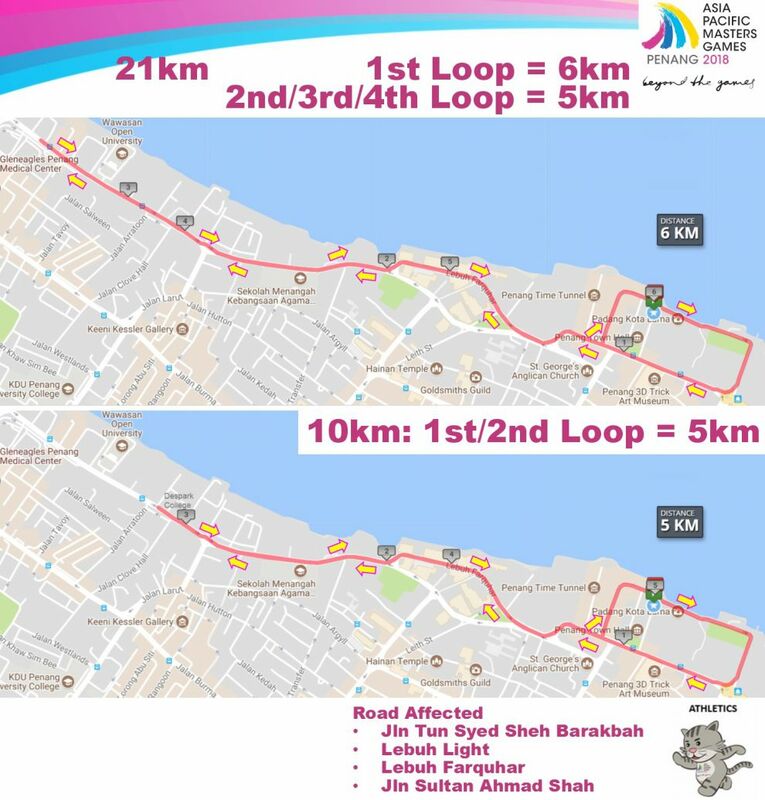 An estimated 5,000 participants from the Asia Pacific region are expected to participate in this nine days of sporting challenge and excitement featuring 22 sports played in one of South East Asia’s top island destination. OPEN to EVERYONE & ANYONE with NO qualifying or selection process involved! Just like the Olympics, there are opening and closing ceremonies, and medals are awarded for the podium finishers in all events. Register now and be part of this historic event! Collection of event T-Shirts shall be held on 7th September, 2018 (Friday) from 2:00pm to 6:00pm. 8th September, 2018 (Saturday) from 10:00am to 2:30pm. Venue: BSG The Galleria, 52 Jalan Sultan Ahmad Shah, Georgetown, Penang. Tel: +60 4-229 6288. It is possible to register with the intention to walk in the Road events; however, as the event is conducted on public roads and permission is provided to close all or parts of those roads, there are certain time restrictions after which athletes will be required to continue the event on the footpath, or for safety reasons, may be withdrawn from the event. However, participants are free to select own accommodation according to own preference. I confirm that I am of adequate health condition to participate in the Asia Pacific Masters Games Penang 2018. I am aware of the risks associated with participating in the Asia Pacific Masters Games Penang 2018 and will not hold the Games organisers, and/or their employees, officials, volunteers and agents, liable or responsible for risks, which include but are not limited to physical or psychological injury, pain, suffering, illness, disfigurement, temporary or permanent disability (PLEASE SELECT including paralysis), economic or emotional loss, and/or death. I am aware and understand that I should make my own arrangement for health insurance prior to taking part in the Asia Pacific Masters Games Penang 2018. 8 23-07-2018 , 12:16:08 Thank you Wah Lee Group for sponsoring lucky draw prizes worth of RM15,000 for registered participant.